Insects are not the only pests homeowners and businesses encounter. Many small animals, rodents, and birds find places in your home to take over as their own. They are sometimes seeking shelter during cold weather. Sometimes they accidentally get in and get trapped. It only takes a small opening for many unwanted critters to make their way into your home. Whether you see the animal itself, hear noises coming from the attic or inside the walls, or see other signs such as droppings or chewed materials, finding signs of wildlife in your home can be very troubling. Squirrels, bats, mice, rats, and raccoons are some of the examples of wildlife that may invade your home. Prime Pest Solutions offers wildlife removal and exclusion services to take care of your wildlife needs. Wildlife and rodents can cause significant damage to your home, as well as bring diseases into the home. Raccoons can tear off shingles and siding from your home’s exterior. Squirrels, raccoons, and rats gnaw on various items including doors, molding, insulation, cables, plumbing, and electrical wiring. In fact, many fires start each year due to damage from rodents. In addition to structural damage, wildlife also brings about concern of diseases. They can carry fleas, ticks, parasites, and mites that will also infest your home. Raccoons are known to carry rabies and roundworm. Bat droppings, or guano, are associated with rabies and histoplasmosis, a lung disease. 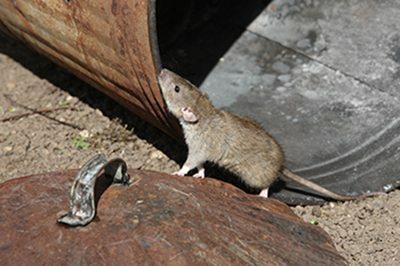 Rodents can carry diseases such as rat-bite fever, bubonic plague, and Hantavirus Pulmonary Syndrome, a respiratory disease. Urine and droppings can leave stains, cause odors, trigger allergies, and infect your insulation with disease-causing pollutants. These pollutants can also make their way into your air ducts, contaminating the air inside the home. If you suspect there is an unwanted intruder, we can come inspect your home and identify the pest. Once an animal has been trapped and removed, we can seal any openings to keep wildlife out. 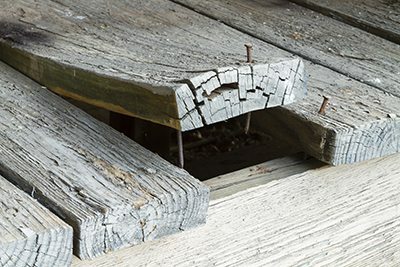 Common entry points include roof vents, chimneys, construction gaps, plumbing, cracks in the foundation, and exhaust vents.